We just made a big move from Boulder, Colorado to the Atlanta area. It has been a fun process seeing our new house become "home." As with any move, it can be a bit of adjustment and I'm doing my best to make the transition easy for my little ones. 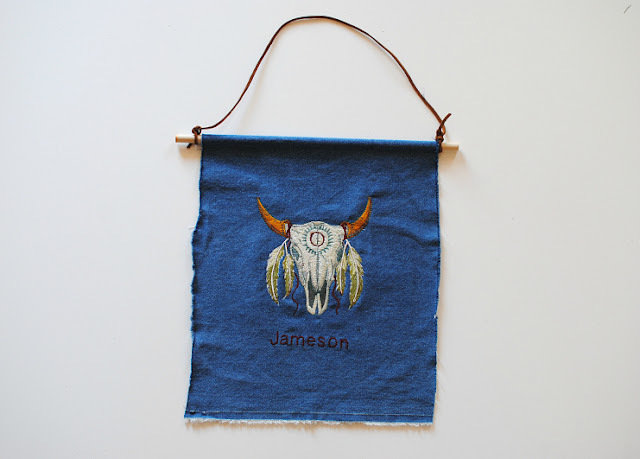 One thing I wanted to do was incorporate my embroidery into wall art for each of my sons' rooms. 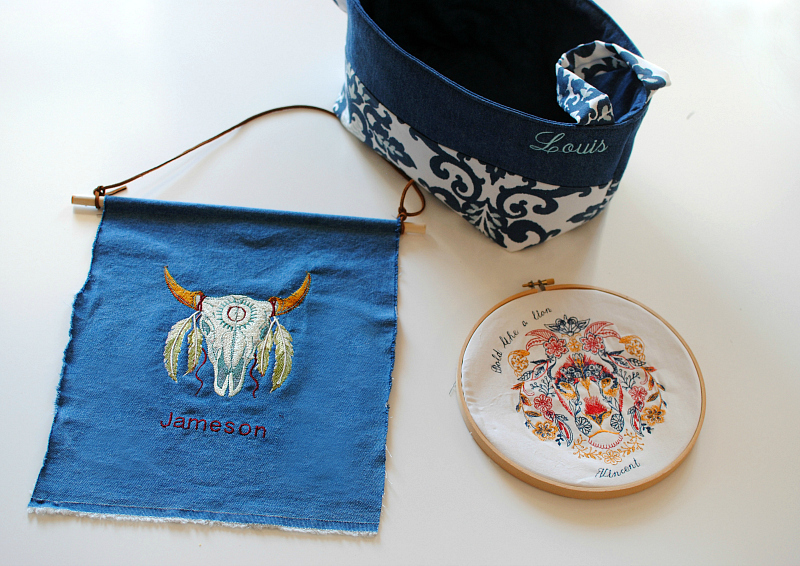 A little custom gift made from mom celebrating their new space. I also couldn't help jazz up my own studio space as well. 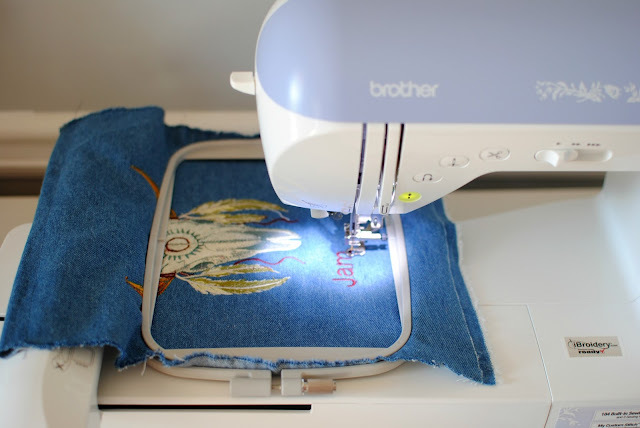 Below I share how simple it can be to make your own wall art using machine or free motion embroidery. Begin by cutting samples of medium weight cotton fabric that measure 2" over the hoop size you plan to use for the art. 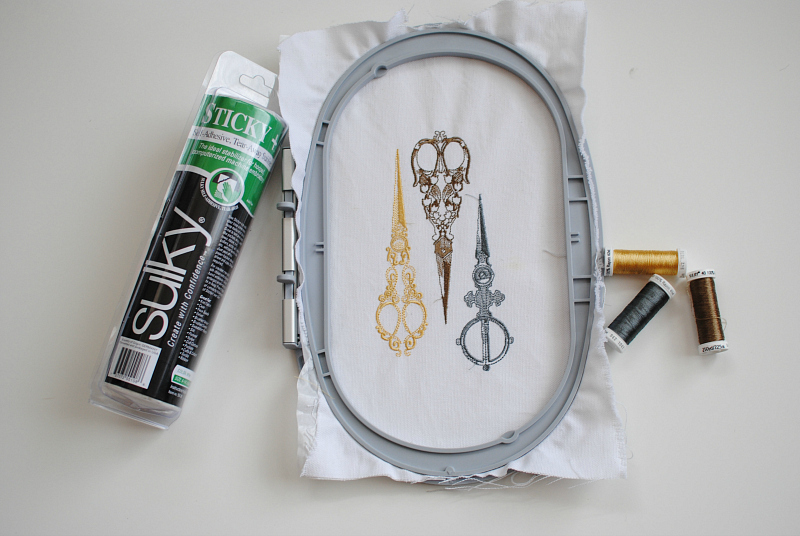 I stabilized the fabric with Sulky's Sticky + Stabilizer. I wanted the designs to pop and have a smooth, shiny finish so I went with Sulky's 40 Wt. Rayon thread. The embroidery was done using my Brother SE1800 Sewing and Embroidery machine. The designs were from OESD (see above for each individual collection). I embroidered a handful of designs to use for each room. Remove the tear away stabilizer, press, and then hoop with your wooden hoop. 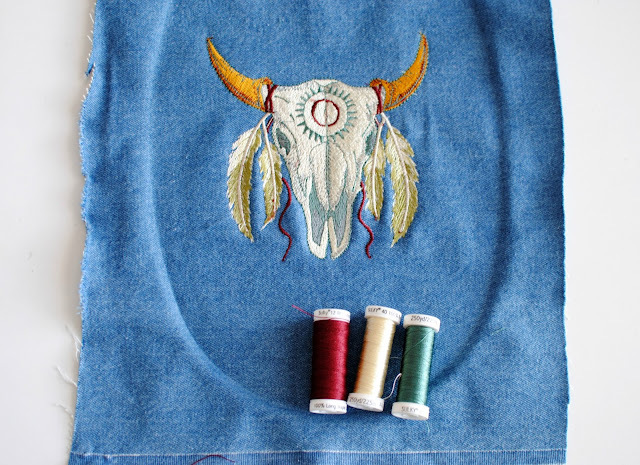 Cut away the excess fabric around the hoop. I like to keep 1" of fabric to fold over and hot glue along the interior of the wooden hoop. 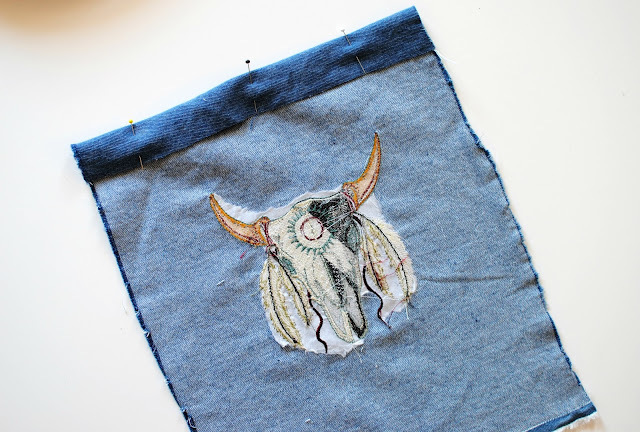 For the Bison Skull my son wanted a hanging tapestry instead of hoop art. So I folded the top over about 1.5" and edge stitched along the raw edge to create a casing for the rod. 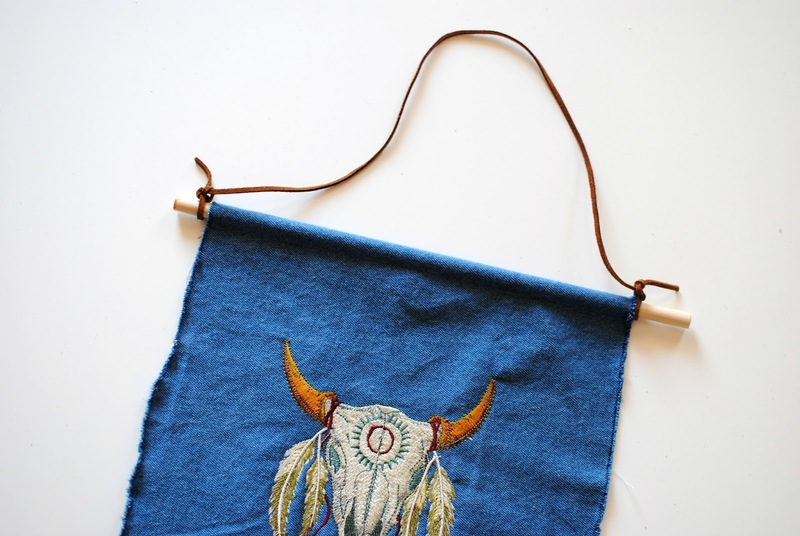 Then I placed the wood rod through and knotted some cording to hang around the edges. 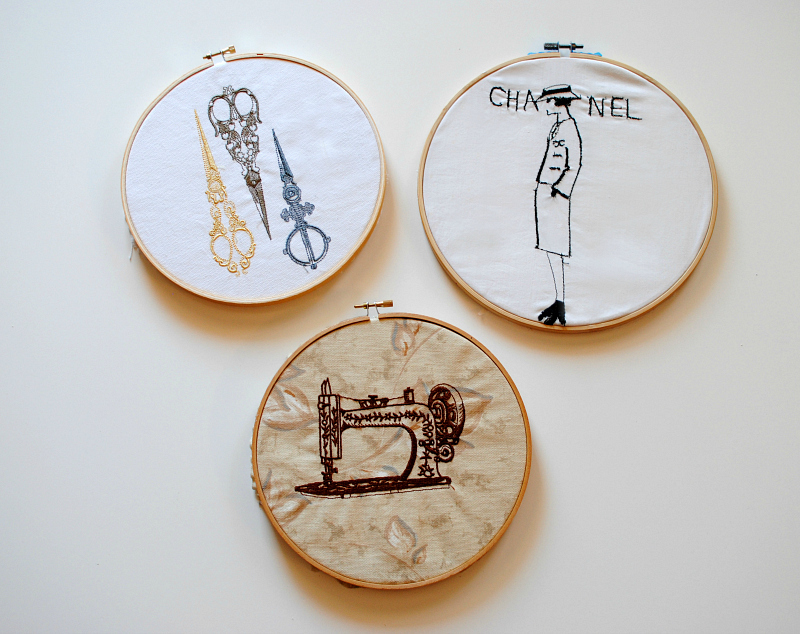 You don't have to have a fancy embroidery machine to achieve this. 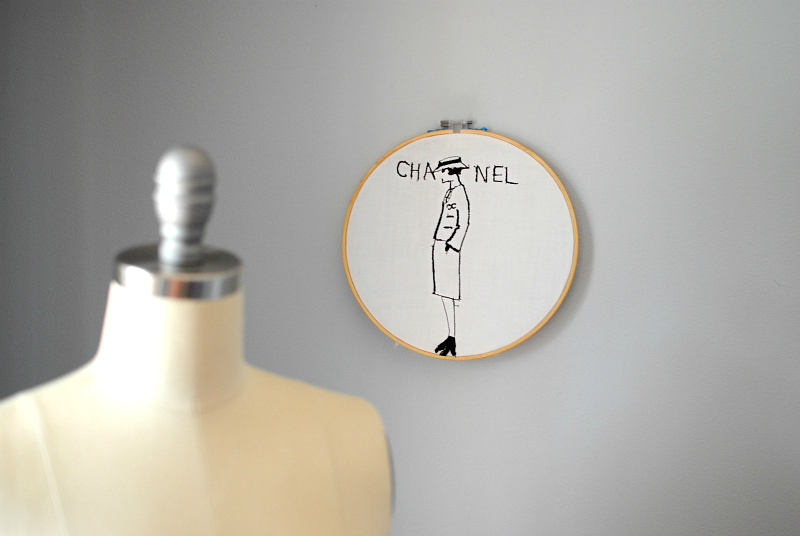 You can use hand embroidery or free motion like I did for this Coco Chanel Design. These all came together nicely and I loved the big smiles on their faces when I gave them the finished projects. Now they want lizards, snakes, and other animals to cover their rooms...Even for Louis I embroidered his name on a diaper basket. There are so many things you can come up with and I'm inspired to do more. Although, for now this will do as I don't want a million nails on my walls. Hi I love your designs. They turned out so well. I ordered some. Did you print yours out on paper? I did, now I don't know what to do??? Help! Please and thank you! Visit the website purely designed for psn games hack. It provide you with the hacks and cheats used while playing games over playstation. Its amazing as it guarantees free psn code generator the delivery of psn codes for free and its very true, visit to explore. in the relevant posts and snap shots are stunning and exceptional and This blogs is so brilliant for me and others too. precise paintings and thanks for sharing me a very quality and top post. Your post was really. The local validation and internal content will be able to transfer. Buy a couple of specialists clear canvases and you could either get a few leftovers of texture or you could likewise buy maybe a couple pad covers/pillowcases Write My Essay the same as the bedding and cut the texture a similar size of the canvas cutting it somewhat bigger than the canvas so it can be folded over to the back of the canvas and simply staple it set up. Greats posts keep it up. control the game and keep pressing opponents. And I still cannot believe that we got one for free What a player..! !